Pittsburg High School coach Tom Nickelson is in his seventh year as Purple Dragon head coach. He talks regularly with past Pittsburg coaches Merle Clark and Larry Garman. They have reminded Nickelson that Pittsburg has never lost to Labette County. Other Pittsburg faithful have also mentioned the success against Labette to Nickelson. 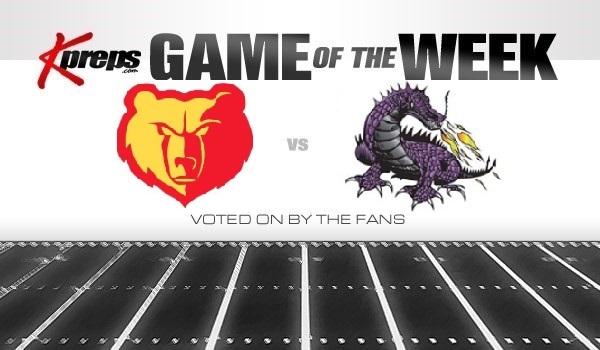 Labette County head coach Sean Price is knowledgeable the Grizzlies haven’t beaten the Purple Dragons. The two teams haven’t faced each other since 2013, a 42-2 Pittsburg victory. Most recently, Pittsburg is 10-0 against Labette County from ’04-13. On Friday, though, Pittsburg plays host to Labette County in a battle of ranked Class 4A squads. Last year, Labette County finished 9-2 in Class 4A, Division I, won the third playoff game in school history and tied the furthest advancement in Grizzly annals with a quarterfinals showing. Labette returns six offensive and seven defensive starters, including senior quarterback Easton Dean, an Iowa State commit, from a team that set a school record for wins. Pittsburg is fourth and Labette County fifth in the Kpreps preseason rankings. The Purple Dragons have routinely been an above average 5A program with eight straight winning seasons. In the last four years, Pittsburg is 9-2, 9-2, 5-4 and 8-3 and again has an experienced senior class. The Purple Dragons surprisingly dropped to 4A when the new classifications came out last fall. Pittsburg is the state’s largest 4A school. Nickelson expects the Purple Dragons to move back to 5A in the next cycle. Olathe West, playing football for the first time, is in 5A, and De Soto also shifted up. Labette County has had an improvement in each of Price’s first three years, including four wins last fall. The Grizzlies and Pittsburg had some trouble scheduling this fall because of the new district format. Each team will play Class 4A Ulysses, on the extreme southwest part of Kansas. Labette was planning to face Parsons in Week 1, but Price said the Vikings elected to not play the Grizzlies. Price said Pittsburg was “an easy choice” especially with Pittsburg now in 4A. This could be the first of two meetings this year between the two Southeast Kansas League schools. The 6-foot-7, 225-pound Dean completed 133 of 192 passes for 2,028 yards with a 22/5 TD/INT ratio. He is also the team’s leading returning rusher with 93 carries for 455 yards and eight scores on a two-platoon team, a rarity in southeast Kansas. Dean started at quarterback/safety as a freshman and then moved to wide receiver as a sophomore as Logan Dean played signal caller. After some injuries, Dean shifted back to defense. He had a high ankle sprain in the third game and didn’t play JV quarterback the remainder of the fall to stay healthy for varsity action. Price said “from an athletic standpoint,” he could see Dean could have a special 2017. Price tried to get Dean to do a highlight video after last year. They put it on Twitter, and Price tagged some schools, though Iowa State was not one of them. An Iowa State assistant coach eventually saw the tape, and Dean went up for a visit during Cyclone bowl practices. ISU head coach Matt Campbell saw Dean and offered him on the spot. Campbell came down in the winter to watch Dean play basketball. Other schools, including Georgia and Kansas State offensive coordinator and former Wildcat great Collin Klein paid a visit. Dean headlines a deep senior class that is the bulk of six returners on offense and seven defensively. This marks the Labette County’s third season in the two-platoon format, a big help for the Grizzlies bumping from 2-7 to 3-6 to 5-5 to 9-2 the last four years. The platooning keeps players fresher and not overwhelmed with information about multiple positions. Senior wide receiver Kale Irwin had a team-high 40 catches and seven receiving scores and finished second with 462 yards. The 5-10, 188-pounder has especially benefited from the Grizzly weight room. The offensive line returns three seniors: Tyler Brock, Parker Boring and Jared Huebner. Junior wide receiver Nathan Smith is a 6-footer who runs well with great athleticism. Smith has had significant injuries the last two falls and is expected to make an impact this year. Senior defensive end Clayton Moore, whom Price labeled “a product of the weight room” suffered a collarbone injury last fall. Moore is a vocal, physical player who had 11 tackles and two TFLs in just three games. Junior defensive end Caleb Haggard is the only one of the top-five tacklers back with 78 stops and 18 TFLs. Senior linebacker Zach McCarty returns, while senior Caleb Hentzen was the team’s top cornerback. Nickelson has mentioned a legacy of hard work and being good teammates and citizens. He asked the seniors, many whom harbor goals of playing in college, to focus solely on this fall and not worry about statistics or next year. White delivered 33 catches for 690 yards and 10 scores. An outstanding athlete, White has low 4.4 speed in the 40-yard dash and has received FCS offers after a breakout 2017. Pittsburg graduated quarterback Chase Curtis, a Shrine Bowl selection. The Purple Dragons had a close quarterback offseason competition between senior Ty Roark and senior Brett Wiemers. Roark earned the starting nod, and Wiemers, one of the team’s top players, is expected to start at wide receiver/cornerback. “You’ve got to have one kid who is the guy,” Nicholson said. Defensively, Pittsburg permitted just 19.8 points per contest in ’17 and 17.2 in ’16. The Purple Dragons returns six starters and key players at all three levels. Seniors Dylan Jordan and Jerek Butcher (team-high 111 tackles) return at linebacker. Jordan has 4.5 speed in the 40 and a high-level track sprinter. On the defensive line, senior Peyton Steele and junior Shay Mahnken return. In the secondary, senior strong safety Joel Kafka is the unit’s leader and a three-year starter. Kafka, a 14-foot pole vaulter, plays with aggression and without fear. He makes all the defensive calls and asks questions about football nuances, including reads and counters.